With so much to do in preparation for a move overseas it’s easy to neglect, forget, or just not realize that advance preparations are needed for dealing with financial responsibilities back home. You’ll also want to be prepared for crooks trying to access your accounts. Being the master of your financial responsibilities back home is easy if you make a few arrangements in advance of your departure. Failure to do so can mean finding yourself a continent away with no means to pay your bills, get cash or remedy a festering financial situation. In this article I’ll share with you what I’ve learned about handling and protecting my finances from afar. Some of these lessons I learned the hard way and believe me, it’s preferable to lean these lessons second hand. Imagine you’re in the United States and discover you’ve lost your credit card. No big deal! Just call your bank and in three days a new card is waiting in your mailbox. Now put yourself in Thailand and try making the same call. The first thing you discover is your bank is eleven hours out of sync with Thai time, which makes your bank’s working hours your new sleeping hours. Even worse, your call may be put on hold for five to ten minutes at a cost of a few dollars per minute. And, when you finally do get someone on the line they may tell you the bank only sends replacement cards to US addresses. From your home address can you count on ever seeing that card in Thailand? Preplanning on your part can help to avoid this and other inconvenient situations that my ruin more than just your day. A scenario many of us face overseas is that when the credit card bill arrives at our school, it’s already overdue. Making a mortgage payment, student loan, funding a stock account or even paying your income tax bill can pose similar problems, all of which can be avoided with a bit of planning on your part before you leave home. 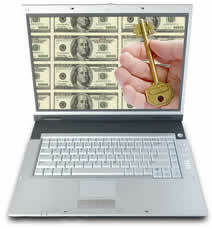 Compounded with the potential of people trying to break into your online accounts, you definitely want to be prepared. Okay, so you know you’re going to have to do some planning, but what sort of planning? In the following paragraphs I’ll fill you in on ways to help make your life overseas as stress free as possible when it comes to dealing with your personal finances back home. While living overseas an international bank such as Citibank is your best bet. I recommend opening a checking, savings and credit card account. Then link all your accounts together and take the steps necessary to allow yourself online access to these accounts. With this done, apply for an ATM card so you can get money from ATM machines worldwide. Have your school deposit your salary into Citibank checking and then go online and move the money to where you need it. With just a mouse click you can make a quick transfer to your credit card and pay your monthly statement or have a check mailed to a designated payee. Best of all, you can open an e-savings account that pays 6% interest and move money in and out of that account in a matter of seconds. A bank such as Citibank is recognized worldwide and your school will have no problem electronically transferring your paycheck from their overseas bank to your account. Maybe you can already do online transfers between accounts with your hometown bank, but one thing an international bank offers that hometown banks do not is the ability to accept electronic transfers from foreign banks in foreign currency. Finding out your bank does not do this once you are already overseas will cause a definite jump in your blood pressure. Imagine having no way to receive your paycheck, except in cash. A first-time overseas teaching couple at my current school is in this exact situation. With the advent of the Patriot Act it’s now impossible to open a bank account without lots of documentation and this takes time, letters, faxes and more. Local banks also don’t offer replacement of lost or expiring credit cards while you’re overseas. While living in Thailand I realized my credit card was due to expire in less than two weeks. I called Citibank and they informed me the replacement card had been sent to my US address two months previous. I explained I was in Thailand and had no way to receive the card. After verifying my account details the women said the card would be sent out DHL Overnight Express at no cost to me. Sure enough, before the end of the week I had the card in my possession. A teacher, new to overseas teaching at my current school lost his credit card and his hometown bank could only send the card to his US address. Five week later he is still waiting for the card. After being robbed, our school keeps no cash on hand and pays us all by direct deposit to our US bank accounts. This makes an ATM card the only way to get cash. The teacher with the lost card has no way to get money except through small advances from the business office. The folks at your hometown bank know you and you’ve no doubt built up a good reputation with these people over the years. This fact alone can have many advantages when you do return home and I recommend you keep this account active. Although International banks have many advantages, some may not have an ATM machine in your hometown. The result is you’ll pay $4.50 or more each time you make an ATM withdrawal. From this standpoint alone it’s wise to deposit a check from your International bank into your hometown bank and then draw on this money, free of charge while you’re in the area. Unless you pay particular attention to your log in information you’ll find yourself locked out of your accounts. Many people are in the bad habit of using the lost password feature to regularly retrieve passwords to their various online accounts. This method may work in the States but oftentimes backfires when overseas. Computers know where other computers are located based on their IP address. Should you, for example, forget the password to your bank account and attempt to use the retrieval link while overseas, you may be denied this information due to your computer’s foreign IP address. A telephone call to the company can reveal the password will be mailed to your home address in the States. Before you leave for overseas teaching I highly recommend you create a password-protected file in Microsoft word, enter all your account numbers along with the log in information and then save this info to a pin drive, CD or your lap top. Should you loose the CD or pin drive no one can access your information because it is in a password-protected file. Be sure to record all important information and numbers you could possibly need from overseas: credit card numbers, bank accounts, passports, and passwords. A few hours work can literally save you weeks of aggravation. Be sure to test the access capabilities of what you have entered and verify that it is correct. It’s better to find out before you leave home than from overseas. If you own stock through online brokerage firms such as Ameritrade I recommend you take steps to set up an electronic link between your international bank and your brokerage account. With such a link you can sell stock online and have the money immediately transferred to your Citibank checking account. From there you can send an online check, pay your credit card or put the money into e-savings where at 6% it may earn more than it would in a sinking stock fund. In addition, once you set up electronic transfer capabilities you can also transfer money from your International bank into your brokerage account for immediate use. To take advantage of stock trends you need to act quickly and waiting weeks for checks to travel from one institution to another can render the entire exercise useless. At this moment you may not foresee this as a problem but again, while in the States this can be set up easily with forms signed and returned under no pressure to get things completed. Once overseas the simple set-up procedure can be painfully slow. Again, take particularly good care of your log in information. Loosing it may spell disaster as you wait for it to be mailed to you. While on the topic of stocks, if you use a stockbroker you should have a way to contact your broker and give him/her a sell order should the market start to slide. Thinking your broker is taking care of you is foolish thinking. Brokers ride out market trends and will do so right to the bottom. After all, they make money weather you win or loose. A few minutes insuring a foolproof way to make contact may mean the difference between winning and losing. Never, never, never respond to one of these emails. If you think there is a legitimate problem and the email you have received my be authentic, do not click a link in the email to get to your account! This link may simply lead to a form that will be sent directly to an unscrupulous person waiting to steal your log in information and your money. Banks all use a secure log in page that can be identified by the https:// in the URL. For example, if you go to www.PayPal.com and click to log in you will notice the URL in your browser begins with https://. The “s” in the address stands for secure. Fraudulent requests for you to verify your information will normally not have this “s” in the address. But some do, so don’t be fooled. It’s easy to copy a web page and add invisible code that allows you to log into your account and at the same time send the information to someone waiting to rob your account. I highly recommend that you delete the email that tells you to verify your information. Then delete all temporary files and all cookies on your computer. You should also run an anti-spy ware program and your anti-virus program at this point to be sure that nothing capable of tracking your key strokes has been put on your computer. With these steps completed, restart your computer and go to your browser and type in the URL of your bank, etc., and log in. If you are concerned about someone tracking your keystrokes (such as in an internet café) you can make, in advance, a file in your email account with your log in information for various accounts. Then copy and paste your user name and password into the required fields for your bank, etc. In this way there are no keystrokes to track. You can never be too safe and a few minutes of precaution will save a long, drawn out affair with financial misery. To clear your cookies and temporary files: In Internet explorer, go to tools>Internet options>delete cookies>delete files. It may be you will need to contact your bank, credit card company or student loan holder from time to time. Calling the States from China, Peru, Thailand or any other country can be devastatingly expensive. Internet telephony, also known as VOIP, is an outstanding alternative to a land line phone. Some years ago I experimented with Net2Phone, which, as the name implies, allows you to call a land line phone from your computer. It never worked well, and, as an example, after calling his mother from Pakistan, a friend of mine found a US embassy representative at his school checking to be sure he had not been abducted by terrorists. It seems the call quality was so poor his aging mother thought he was being held captive in a cave. Today’s technology has improved and Skype.com and others offer a service that rivals the quality of the telephone. Most calls from your computer to a land line phone average less than 1/5 of a cent per minute. I call my daughter in Europe and we speak for an hour and I pay practically nothing. When the need arises to straighten something out back home Skype.com is an invaluable service. You can call your bank, be put on hold while the agent looks into your problem and not worry about the cost of the call. I do, however, recommend you set up your account before leaving home or at least before you have an emergency and really need it. With Skype or a similar service you really can handle all your business back home from anyplace in the world. I hope I’ve given you some good ideas in this brief article. From here you should sit down and make a list of everything you do at home in relation to your finances and other obligations. Then figure out and test exactly what you will do to meet the requirements of these obligations once out of the country. You’ll be glad you did.